RMP Tracker distributes commitments to your local markets so you don't have to. PV teams are relying on passive tools, like spreadsheets and email, to manage their critical processes and commitments. This is even true in risk management, where the stakes couldn’t be higher. 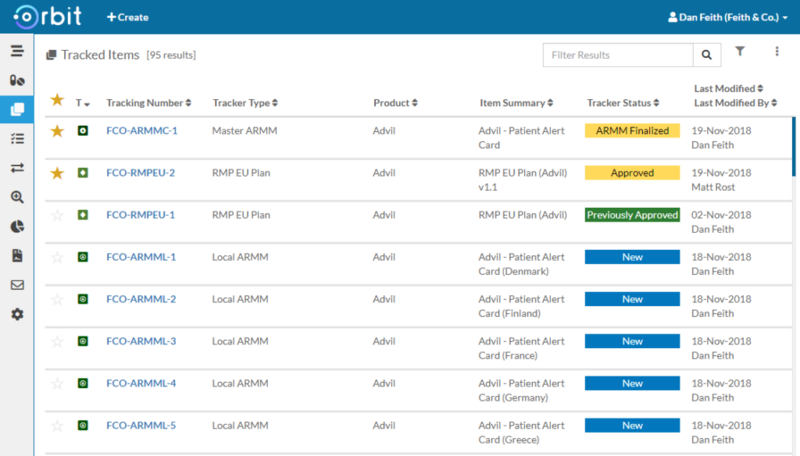 Break down data silos in Orbit—where your users can easily spot deviations, copy Core and EU commitments to their local plans, and even receive notifications when there are new commitments (including Educational Materials and other RMMs) or updated plans. Empower your PV & RM teams with proactive tools that are easy and intuitive to use—the answer is RMP Tracker. Capture and version details of your risk management plans, track commitments, activities and milestones, all while monitoring your global process results. Reduce data entry time by distributing commitments, deadlines and documentation from Core and EU plans throughout all global markets. Use dynamic reporting to respond to local and global regulators, and make it easier for managers to oversee the process internally. Spot local deviations from Core and monitor local compliance with aRMMs and other RMP Commitments. Track Risk Minimization Measures globally—whether or not there's a local Risk Management Plan. Distribute aRMMs, including Educational Materials, to local markets in a single click. Track Local HA Negotiation and aRMM Implementation with true global oversight. pharmacovigilance commitments and risk minimization measures. This is what your plan admins have been waiting for.